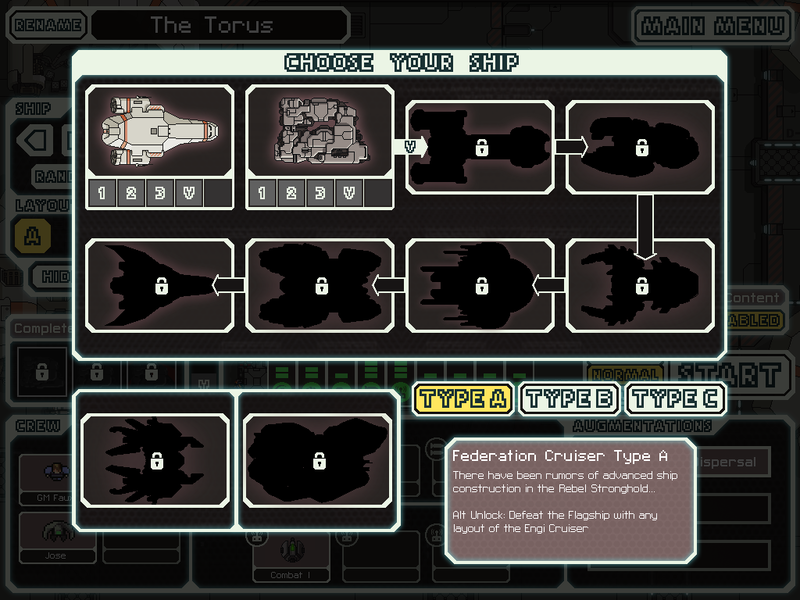 FTL: Faster Than Light is not a kind game. Even on the easiest difficulty setting, the odds against you stack high enough to make even the most seasoned Dark Souls authority quiver with fear. The new Advanced Edition update doesn’t change any of that. Hell, it adds a Hard mode to the game. That’s just sadistic. With all of the new content added by Advanced Edition, plus a first-time appearance on iPad, we expect that there are plenty of new players discovering FTL for the first time and plenty of longtime fans returning to see what all the excitement is about. We’re here to help. These 10 tips don’t specifically apply to Advanced Edition, since all versions of the game now have that content, but they still might help you survive long enough to reach the rebel flagship. From there, you’re on your own. That thing is the worst. Death is a universal truth in FTL. It might happen under the sustained fire of the giant rebel cruiser at the end of the game, or it might happen after your very first jump. You need to let go of your impatience. 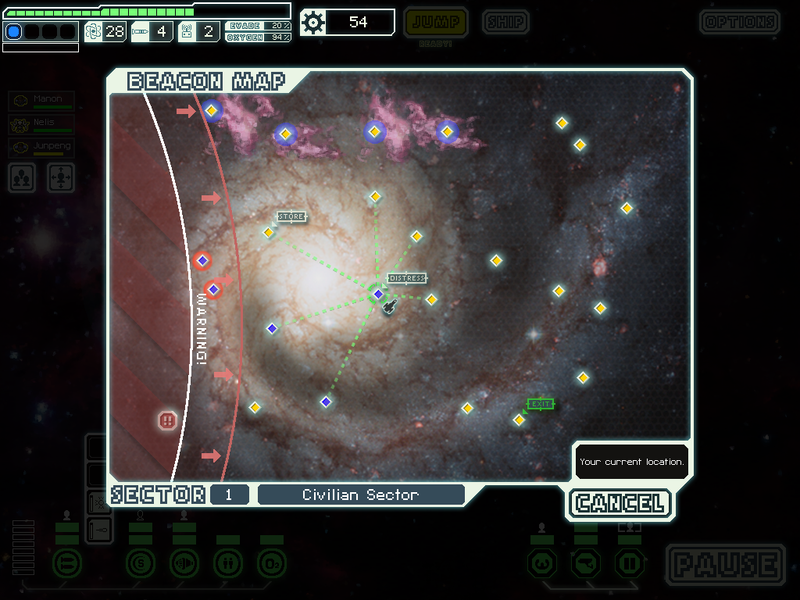 The random delivery of events as you leap from system to system weights the odds heavily against you, and more often than not, a game will end with your crew sucking vacuum. Don’t be afraid to restart completely if it’s clear a game is turning against you. That’s going to happen often. The early sectors in any FTL game are the ones you’ll want to spend the most time exploring. Each jump you make inside a sector brings the pursuing rebel fleet closer, and you’ve got lots of fighting with few rewards if they happen to overtake you. Later sectors throw much tougher ships and challenges against you, so maximize your scrap (FTL‘s currency) gains early by exploring as much as you can. Consider investing early in a Scrap Recovery Arm and/or Long-Range Scanners if you happen to see either in a store. These are both a big help throughout any game. Mind your resources. They’re all listed in the top left corner of the screen, under the damage meter. If you rely heavily on missiles or drones, make sure you stock up whenever you visit a store. You’ll always rely heavily on fuel, so make sure you grab that whenever you can as well. Play it smart though; if you have 15+ fuel, you can safely spend in other directions. 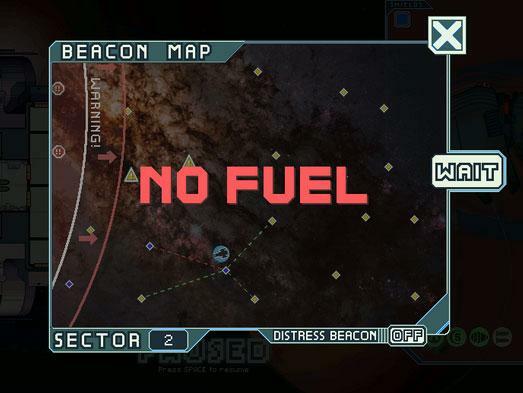 It’s not game over if you run out of fuel mid-sector, since you can wait for help or deploy a distress beacon, but both of these carry the risk of drawing rebel attention. What’s important is to always be mindful of what you’re using and what you need. There are two layers to upgrading your ship: the individual systems and the core reactor. If you don’t have a powerful enough reactor, you’re going to have to make tough choices when it comes to feeding partial power to different systems. Try to upgrade the reactor and individual systems together whenever you can. It’s tempting to juice up your weapons immediately, but it’s generally smarter focus your early upgrades in other directions. This all depends on the ship you’re using of course. 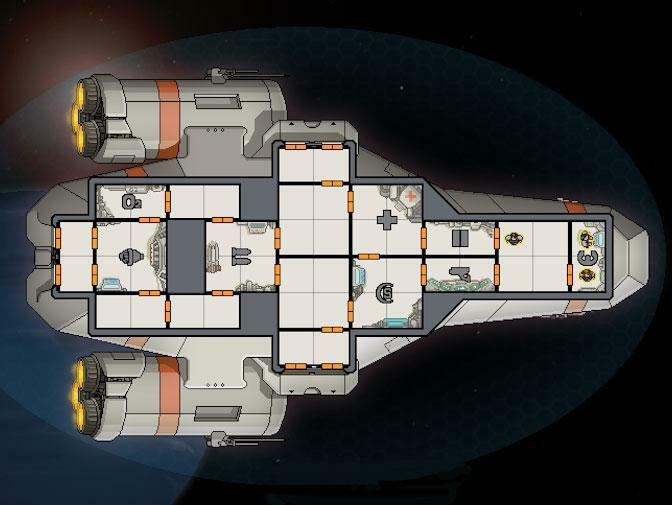 The Kestrel, which is the starting ship and the one you’ll spend the most time with early on, has enough firepower to carry you through the first half of a game. 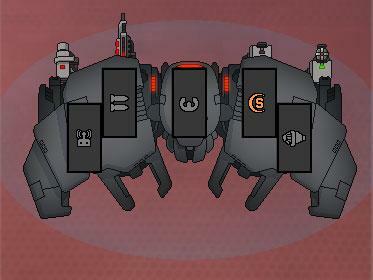 The Level 2 Medbay is cheap and opens up lots of extra options for various events. Level 2 Doors help prevent fires from spreading. Put a priority on Level 2 Shields and Engines as well, since they increase your durability and evasion, respectively. The less damage you take, the less scrap you’ll have to spend on repairs. There are dozens of strategies for surviving in combat, all of them dependent on how you’ve built out your ship, but there are some truths in FTL that apply universally. First and most important is that it’s best to be a focused weapon of mass destruction rather than a Swiss Army Spaceship. If you’re stacked with ranged weapons and have a small crew, don’t bother investing in a Teleporter system. Your choices in this regard are often influenced heavily by your choice of ship. Take note of each ship system and crew configuration. Play to your strengths. 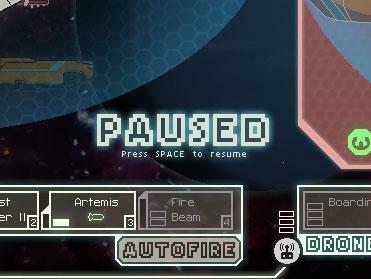 FTL is a game of micromanagement more than anything else, and the pause feature is a vital part of that. Enemy shields recharge quickly, so try to fire all of your shield-susceptible weapons in a cluster by pausing immediately after you give the fire order on one to stack another fire order behind it. Ion shots knock your shields out quickly, but you can prevent them from leaving you vulnerable to other weapons fire if you pause and cut power to your shields when you see one of the slow-moving balls of electricity heading your way, then restore power immediately after impact. Pause is also necessary for boarding actions – engaging in them or repelling them – since you’ll want to keep your crew together. Every ship-to-ship battle has different needs, but combat always boils down to keeping your enemy off balance by forcing them to play catch-up. You’ll want to target two, even three, key ship systems so the opposing ship’s crew always has more than one repair to worry about. Weapon and Shield systems should be a top priority. 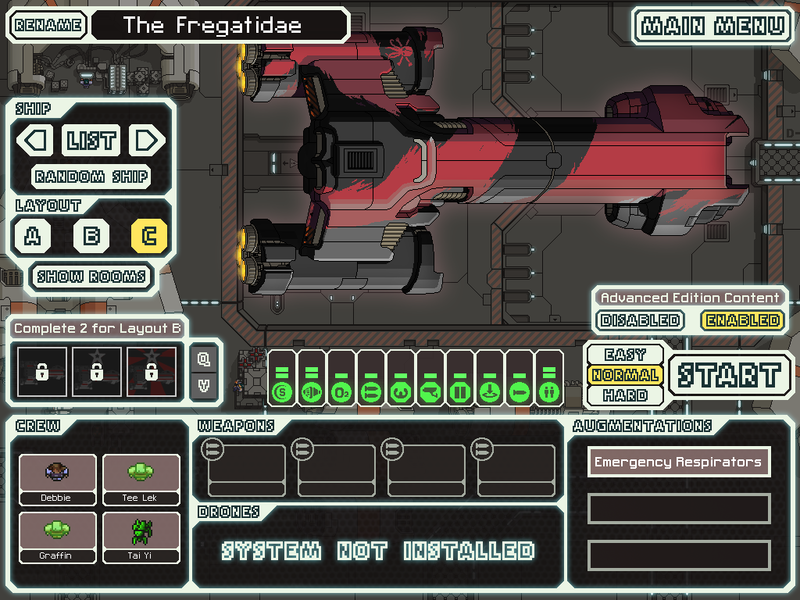 Engine too, especially if you see “FTL charging” in the enemy ship window; that means they’re trying to escape. This might change depending on your weapon loadout, but one good strategy is to target the Weapons and Oxygen systems, since the former knocks out your enemy’s offensive capabilities and the latter gets repair priority. 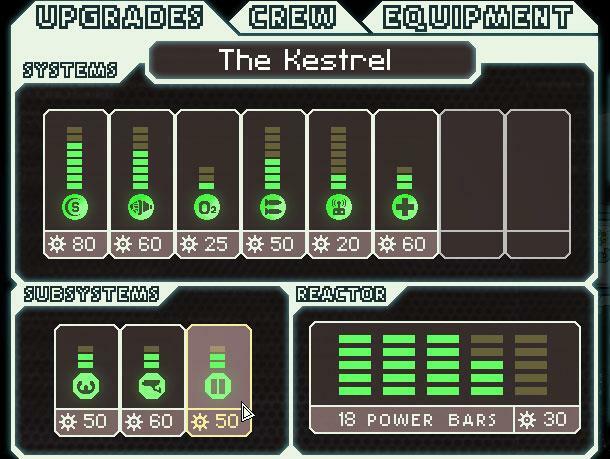 A capable crew is essential to surviving in FTL. You’ll want to have bodies manning Engines and Piloting for sure, to improve your survivability. Manned systems get an effectiveness upgrade without the need for extra reactor power. Your crew also earns experience for all activities: working on individual systems/subsystems, combat (during boarding actions), and repairs in general. Make sure to establish clear-cut roles for each crewmember; you won’t want your pilot manning the Weapons system. Advanced Edition helpfully adds the ability to save crew configurations and then use that to issue a global “return to stations” order. The Kestrel is an OK starting ship, but just like every other ship, it’s purpose-built for a particular kind of play. You’ll want to unlock more. The unlock conditions for most of FTL‘s ships are steep, typically requiring you to take down the rebel flagship with some other vessel. There are, however, hidden missions that offer an alternative route to filling your hangar up. 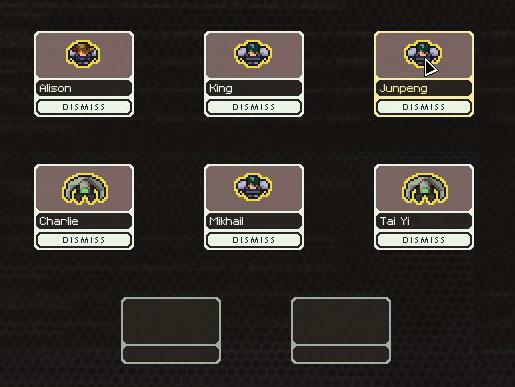 There’s no surefire strategy for finding them, since all events in FTL are random. This leaves you with two options: check on the Internet or experiment every chance you get. One game is not a huge time investment, and it’s always more valuable in the long run to take a risk on an option you’ve never seen before. Certain events, for example, have hidden choices that only unlock when you have certain ship systems or crewmembers. If you highlight a locked ship, you’ll see a vague hint about what the hidden unlock mission might entail. We won’t judge you if you ask the Internet though. FTL doesn’t change dramatically with the Advanced Edition update; there’s simply more going on. Purists have the option of turning off the new content from the main menu, though that can also be helpful for newcomers as well. You’re not the only one with access to the new stuff; your enemy uses that gear as well. If it’s your first time playing, try setting out a few times with Advanced content turned off to get a sense of how the game flows. There’s a whole lot of new stuff in the update, including a new race and an assortment of gear, but we’re going to focus here on looking at the three new ship systems, since that’s what you’ll likely encounter the most. Hacking allows you (or your enemy) to disrupt a ship system in a variety of ways, depending on the targeted system. Hacked Weapons lose their charge, but a hacked Teleporter brings enemy boarders back to their ship. The Clone Bay revives dead crewmembers and restores some crew health with every jump, though it completely replaces your Med Bay. Finally, Mind Control turns enemy crew over to fight for you, but they’ll need to be visible on your ship’s sensors. Don’t be afraid to set your difficulty to Easy. 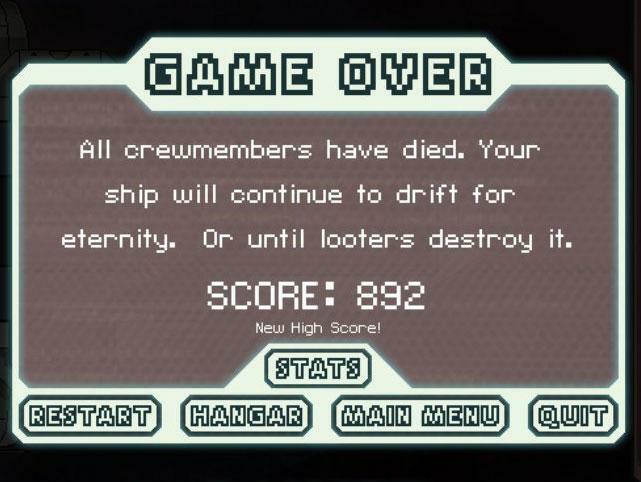 Let’s be clear: FTL is never actually easy, you just stand a better chance of surviving on the lower difficulty. Save Normal and the new Hard settings for later, after you’ve gotten a sense of how the game works and left this guide far behind.